I love the holidays & the cold weather is the perfect time playing board games inside. Our latest addition to the games shelf is Spot It! Holidays, a fun matching card game. 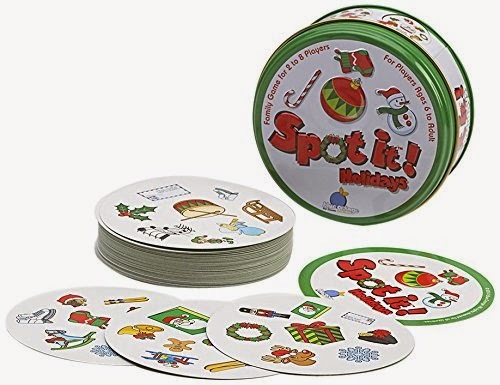 The game consists of 55 round cards in a travel-friendly tin (perfect for Christmas stockings!). You play it with 2 to 8 people, ideally for kids six & up. Players look at all the symbols on two cards & identify which one is the same between the two cards. The first person to Spot It!, wins. There are five different ways to play outlined in the included illustrated instructions. The game develops focus, visual perception, language and fine motor skills. I found the game fun with my four-year-old--he's younger than the intended audience, so we didn't play it competetively. He liked the challenge of finding the same picture on both cards & wanted to go through the whole deck. You can find Spot It! Holidays at toy stores all over the place. The game is just one version of many--check them all out here on the Blue Orange Games website.